Civil rights activist, who marched with Martin Luther King in Selma. She became the first black state Secretary of State, but in 1977 she was fired by the Governor of Pennsylvania from that position after she used government employees to write private speeches on the government dime. Attempts to run for Lieutenant Governor, the US Senate and the US house ended in failure. 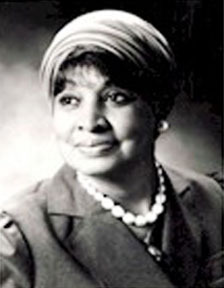 Tucker was instrumental in founding the National Political Congress of Black Women (the "Political" later dropped from the name), an organization which she became chairwoman of after the retirement of Shirley Chisholm. Among her more controversial viewpoints was opposition to rap and hip-hop music, which came to a head after Tupac Shakur was nominated for an NAACP award. Tucker was "ready to go to jail, ready to die, whatever is necessary to stop this pornographic filth." She and unlikely ally William Bennett helped persuade Time Warner to drop their Interscope and Death Row Records labels. Tupac later took an opportunity to rhyme her name with an expletive in one of his songs.